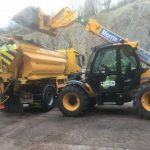 Devon County Council is expecting challenging conditions for its gritting teams overnight on Tuesday. Following light snowfall on higher ground and wintry showers across parts of the county earlier in the day, some areas can expect road surface temperatures to drop below -2C, which could create icy conditions. So far this winter, less than half the average amount of salting treatments have been needed on the county’s roads. However, colder than average temperatures are expected over the coming weeks. • ensure you are stocked with food and medications. Radio Exe has regular travel bulletins throughout the day too.